“It was a real sweet spot of a moment to get this building,” Laura Vandenburgh told the crowd, a mix of College of Design and UO faculty and staff members and people from the community, including President Michael H. Schill, Eugene Mayor Lucy Vinis and developer Brian Obie. Vandenburgh, the head of the School of Art + Design, addressed the gathering for the soft opening of 510 Oak, the new home for Art and Product Design faculty research studios and the Center for Art Research. 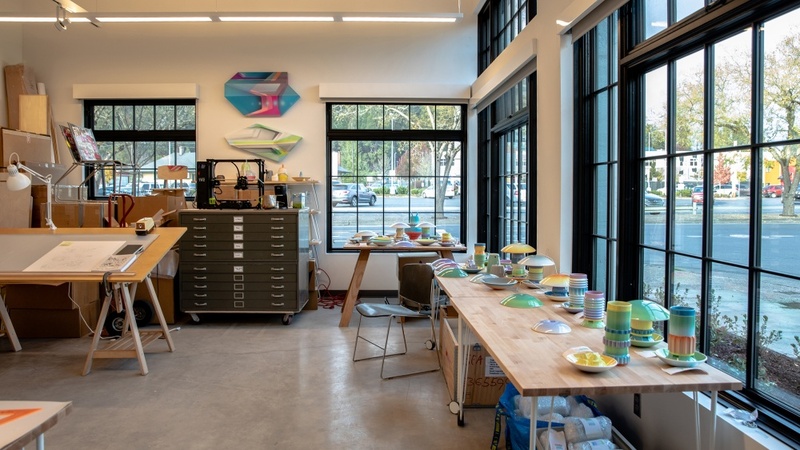 The building, purchased by the UO in 2017 and newly renovated by local firm 2fORM Architecture, will celebrate its grand opening to the public and will be the first stop on the Lane Arts Council’s First Friday ArtWalk on Dec. 7 at 5:30 p.m. Work from the 24 faculty members with studios at 510 Oak will be on display, and Vandenburgh will speak. Liora Sponko, executive director of Lane Arts Council, said the building will help cement Eugene as an arts destination for cultural tourism. Vandenburgh called it a watershed moment. “The institution is investing in the ways we do research, which is studio practice,” she said. The two-story 510 Oak building houses 22 studios for 18 art faculty members and six for product design faculty members. Two of the studios are double the size for product design, which more often requires team collaboration. Vandenburgh said it will benefit the community not only to see art and design pieces but also be witness to the sometimes-mystifying process of creating them. In the coming months, 510 Oak will also launch the Center for Art Research, which Vandenburgh described as a think tank for artmaking. “It’s about how artmaking can ask questions in different ways than other fields,” she said. Vandenburgh explained the many opportunities for interaction and collaboration that the space provides, from giving feedback to professional networking to a broader exposure to visiting curators and art critics. Historically, art and design studios have been scattered around campus and the city. This is the first time they will be making and conducting research in proximity to one another. “To be working alongside one another is incredible,” she said.